I wasn't planning on starting seeds indoors this year. I don't have grow lights or a heat mat or even a suitable place to set them up, so I was just going to buy transplants of long-season crops and direct sow everything else. 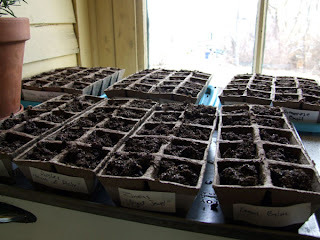 But then when my seed order came from Baker's Creek, then sent along a free sample pack of tomato seeds, and I can't not plant them, but in Duluth tomatoes need to be started indoors. So I went and bought peat pots and some soil and cleared of a shelf in front of the south-facing window in my mudroom. And then I remembered that my grandma sent me moonflower seeds that I need to start early, oh and I guess broccoli should be started indoors, and while I'm at it I can start some of my herbs, and, well, one thing led to another. There's no outlet in the mudroom, so I couldn't even set up up a grow light if I wanted to (I could maybe snake a cord in from the kitchen) so I'm hoping sunlight will be enough, because now I've made an Investment. Two days and no sprouts yet, but, well, it's only been two days.